Take a Vista View into your machine. Now that Windows Vista is in full swing, we get to experience some of the freshest breakthroughs in technology today. As Microsoft develops this exciting new platform, we have not be amiss in preparing complete support for Windows Vista at our Optimize Vista support site, along with continuing our discoveries of Windows XP. M.I.C.A. is here to help you overcome the worries of new technologies - while providing fun, easy to use instructions on ways to experience Windows Vista and XP. If you do not find the help you are seeking, Contact Us so we may provide it at no cost to you. We care about your computer experience...here at M.I.C.A., and throughout the world wide web! When you start using Windows Vista, you will recognize familiar elements such as the Start menu, which is now faster, more streamlined, and more helpful than in previous versions of Windows. 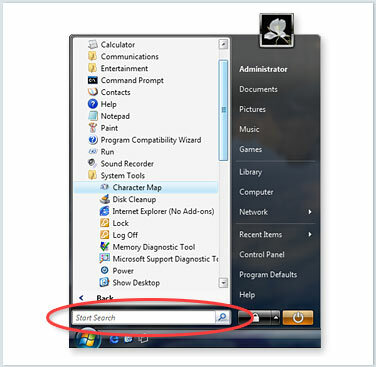 The Start menu features integrated desktop search through a new feature called Quick Search which can help you find and launch almost anything on your PC. Just type in a word, a name, or a phrase, and Quick Search can find the right file for you. But more than that, the new start menu makes it very easy for you to navigate across all of the installed applications on your PC. Eliminating the slow performing, cascading "All Programs" view, the new start menu can help you get something started more quickly than ever. Use Quick Search to quickly find the information you need. The new Explorers are powerful yet easy-to-use tools for working with files consistently across Windows Vista. Explorers give you more information and control while simplifying how you work with your files. The experience is easy and consistent, whether you're browsing photos or documents or even using the new Control Panel. The new Document Explorer makes working with your files a snap. Find your files more quickly with the new Live Icon feature, and see what they contain without having to open them. Key elements of the Explorers in Windows Vista are designed to help you get to the information you need, when you need it. Quick Search is always available to help you find files instantly. The navigation pane contains the new Search Folders found in Windows Vista, as well as traditional folders that you have created on your computer. Command Bars display only the tasks that are most appropriate for the files being displayed. With new Live Icons (scalable thumbnails) used throughout Windows Vista, you can see the first page of documents, the actual image of a photo, or the album art for individual songs in your music collection, making it easier to find exactly what you are looking for. Type keywords into the Quick Search box in the new Control Panel to find the right system setting quickly. Windows Vista is the first Windows operating system that has a user experience that can gracefully scale to the hardware capabilities of the computer it is installed on. All computers that meet minimal hardware requirements will see the Windows Vista Basic user experience, which provides the benefits of the refined interface features already mentioned. 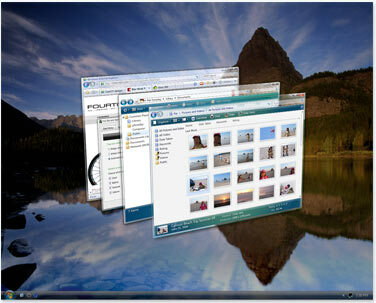 Windows Vista Aero provides spectacular visual effects such as glass-like interface elements that you can see through. Windows Aero is an environment with an additional level of visual sophistication, one that is even more responsive and manageable, providing a further level of clarity and confidence to Windows users. 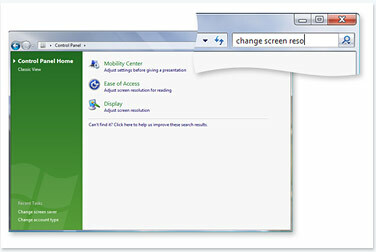 Resting the mouse pointer over a taskbar item displays a live thumbnail of the window, showing the content of that window. The live thumbnail is displayed whether the window is minimized or not, and whether the content of the window is a document, photo, or even a running video or process. See thumbnail views of the items in your taskbar by resting your mouse pointer on them. Windows Vista provides two entirely new features to manage windows: Windows Flip and Windows Flip 3D. Flip allows you to flip through open windows (by using Alt+Tab), providing a live thumbnail of each window, rather than just a generic icon and file name. Live thumbnails make it easier to quickly identify the window you want, particularly when multiple windows of the same kind are open. With Flip 3D, you can use the scroll wheel on your mouse to flip through open windows in a stack, and quickly locate and select the one you want to work with. Use Flip to view and navigate more easily through open windows. Use Flip 3D to navigate through open windows using the scroll wheel on your mouse.